Selected publications of the Mineralogical Association of Canada are available through MSA and are listed below. This volume highlights the research that can be integrated into refining exploration strategies for uranium and also discuss new developments in thorium deposits as a future energy resource as it will become an increasingly important by-product of REE mining. This MAC Short Course volume addresses both the theory behind the phenomenon of cathodoluminescence (CL) and the application of this microscopic technique to all fields of geoscience investigation. Aimed at the graduate student, researcher and practicing professional, short course chapters will cover the basics of theory, causes of cathodoluminescence in minerals and materials, instrumentation, recent advances in cathodoluminescence imaging and spectroscopy data collection, and interpretation of spectral responses. Case studies relating to sedimentological, petrological, mineralogical, petroleum geology and economic geology fields will be included. This short course volume looks at gemstones from a geological perspective and reviews our current understanding of diamond, ruby, sapphire, and emerald deposits, but also examines the lesser-known colored gems. This short course volume presents the many aspects of uranium, an element that changed the course of the world like no other. The content spans the mineralogy, geochemistry, and ore deposits of uranium, and includes nuclear waste challenges and solutions, weapons proliferation, and nuclear forensics for attribution and nuclear security. The volume brought together a panel of international experts focused on educating graduate students, early career scientists, and researchers seeking a deeper involvement in the field. The purpose of this course volume is to introduce geologists to modern technologies and techniques for studying the petrography, mineralogy and mineral chemistry of sediments and sedimentary rocks. The approaches provide new insights into paleo depositional environments and drainage systems, diagenetic histories and basin architecture. Minerals are important in this context because they preserve an archive of geological processes or surficial conditions that is often homogenized or disturbed at the scale of bulk samples. Obtaining a quantitative and predictive understanding of geological systems, including exploitable energy sources, requires knowledge of the age of origin and subsequent thermal history of the system over geological time. While analysis of milligram- and microgram-sized materials is routine, obtaining important geologic information from features such as zoned minerals and cemented intergranular regions requires in situ measurements at the micron scale. An important breakthrough in this regard was the development of the secondary ion mass spectrometer (SIMS). SIMS is capable of performing precise and accurate (i.e. per mil to sub-per mil) in situ measurements of most elements and their isotopes with ca. 10 micron resolution. This short course volume introduces SIMS analytical techniques and assesses their applications in the Earth sciences. Topics include light stable and non-traditional isotope analysis, radiogenic isotope analysis quaternary geochronology, and depth profiling techniques. 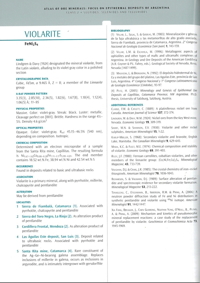 Much has changed in the field of LA-ICP-MS since we published Short course volume 29 on the same topic in 2001. The technique has matured and expanded markedly, both in terms of the specific instrumentation used and the application base it serves. Whereas in 2001, the primary use of the method in the Earth Sciences was for in situ analyses of trace-element concentrations, today a significant and growing volume of work done with these instruments is centered around in situ isotopic analyses. This brand new short course volume comprises 16 chapters and several appendices. A CD containing the chapters of Short Course Volume 29 Laser Ablation in the Earth Sciences is also included. 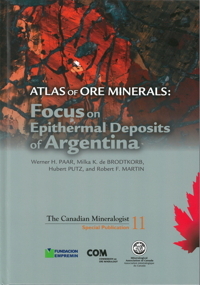 In this Atlas of Ore Minerals, we focus on the mineral species encountered in ore deposits of the Republic of Argentina, many of them of epithermal type. We describe 210 ore minerals, illustrate their associations, both with macrophotos and in reflected light, and document their chemical composition. Enlightened interpretations of textural features hold the key to the establishment of paragenetic sequences. 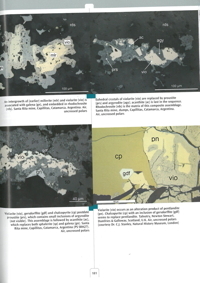 We include an account of the tectonic evolution of Argentina and describe the more unusual mineral deposits, like Pirquitas, Famatina, Capillitas, Quevar and Tumiñico, all characterized by very complex assemblages, including selenides in some cases. 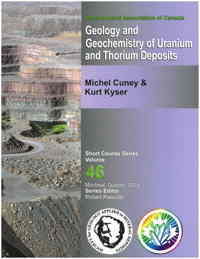 The 400-page book is published with a DVD of all mineral photos as a resource to teachers, students, and researchers. Gemstones have fascinated people for thousands of years because of their beauty, rarity, and monetary value. However, a true understanding of gemstones and their properties has only come about in the past two centuries resulting from the developing science of geology and mineralogy and an increasing need to distinguish natural gemstones from those that are treated or grown in the laboratory. Numerous books describe minerals, and a number of them report on the distinctive properties of gemstones, but there are almost no books that present a more detailed mineralogical description of the gem minerals, along with a clear explanation of basic concepts of interest from both mineralogy and geology. 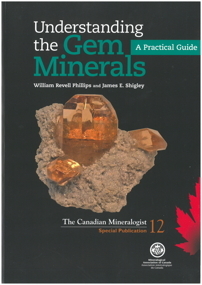 Written by William Revell Phillips and James Shigley, Understanding the Gem Minerals: A Practical Guide bridge this gap. SYSTEMATIC MINERALOGY has as its main goal a survey of crystalline species, the basic building blocks of all natural assemblages. As a nascent area of investigation under the guidance of such visionaries as Romé de l'Isle and René-Just Haüy, mineralogy consisted essentially of the systematic approach. Since then, the field has evolved and developed in multiple directions. Nevertheless, systematic mineralogy remains a solid core, enriched each year by discoveries of a hundred or so new species. 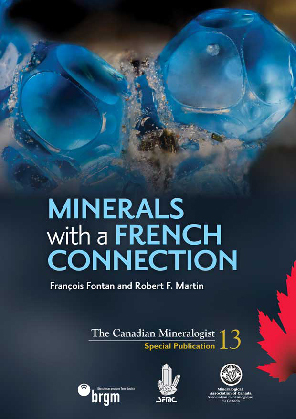 This book offers an opportunity to illustrate this systematic approach in the context of mineral species with a French connection. François Fontan (1942-2007), research scientist (CNRS) at Université Paul Sabatier in Toulouse (France), undertook the project, and Robert Martin, Emeritus Professor of Geology at McGill University, Montreal (Canada), brought it to fruition. The profiles and discoveries of past and contemporary contributors to the vitality of mineralogy in France are highlighted, as is the geological context of the type localities.